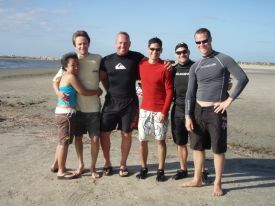 1) New Friends - This has to be one of the top reasons to take a kiteboarding vacation. Great people, great times and the best of memories - some of the juice of life. 2) Extend your season - for those of you who are riding well and live in the Midwest, we are dying to get in the water and kick off the season. We can and do hit the lakes around mid-March to early April, but it is COLD! Limited jumping, short sessions, and some real cold water safety issues. Think of it this way - on a good year most people get 30-40 sessions - if you go to a great destination and ride for 4-5 days out of 7, you just added 10% more riding for your whole year. 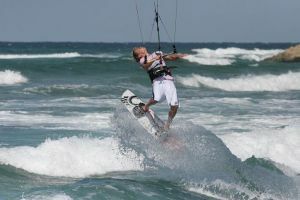 3) Learn - For anyone who wants to become a kiteboarder there is really no better way than to spend a full week being dedicated to the sport. Often it takes a new rider a whole season to get dialed in. But get one week straight of kiting and you will be dialed in. I went to South Padre a few years back and went from riding to staying upwind. The next spring, Hatteras allowed me to land my first jumps. Consecutive days on the water are simply the best way to learn. 4) Ride new places - I will say that the Midwest does offer some of the best riding in the world. But the world is a really big fun place. Checking out a new island or riding 15 miles of unlimited flat water in 25mph is an amazing feeling. 5) Relax - Hopefully this one does not apply. 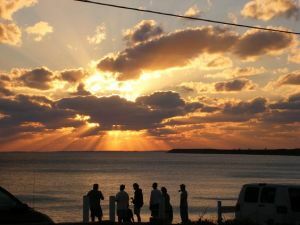 An ideal kiteboard vacation has you passed out at 10pm to make sure you have energy for the next day's marathon sessions. About a month ago, I received a phone call from Kent Marinkovic asking if I might be interested in traveling to the island Eleuthra to film and ride with the Pro Cabrinha Team. After a few minutes of conversation, reality set in and I remembered that I had no money and there was no way that I could afford a plane ticket from Salt Lake to that tropical paradise. 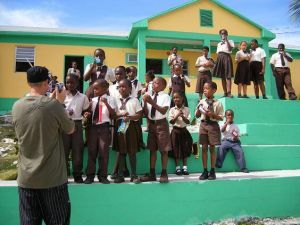 I mentioned this to Kent, and within a matter of seconds he replied, "Bahama tourism board is covering it all." So next thing you know, I was on my way to Eleuthra with Pete, Dre, Elliot, and Damien. We arrived at the island and met up with these strange folks that had bags the size of small kayaks- yes, they were windsurfers- Jason Polakow and a few of his sponsored athletes met up with us at the airport and we crammed into our mini vans and headed to the hotel. The next week we spent kiting and windsurfing all over the island from flat water lagoons to double over head waves off the reef. The wind was surprisingly consistent ranging from 15-25 every day. I helped Elliot shoot for his upcoming movie "Metropolis 2" as well as having the pleasure to kite with my idols at this paradise of an island. After a week of kiting every day we were wrecked, so we took some time off and went spear-fishing, cliff jumping, and yes, a little sightseeing. The food was amazing, ranging from lobster we caught spear-fishing to the ever-so-pleasant peanut butter and jelly sandwiches! After spending 8 days with all of these fine water-sportsmen, our trip had come to an end. I had realized how normal these pro riders were and that we all shared the common goal of going out and having fun. Whether you are Pete Cabrinha or Kevin Steen, we all respect the beauty of the ocean and we're all looking for that next windy spot! Editor's note: Kevin graduated from high school 5 months early to pursue his passions of kiteboarding and skiing. Let's all cheer Kevin on and hope he can make it to "rock star" level in the kite world. It's always nice to have a local boy filling the magazine pages. Nice job Kevin!